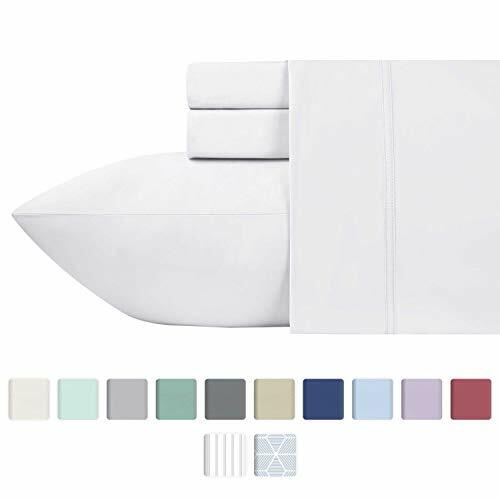 QUEEN Size Luxury 4-Piece Bed Sheets Set - Each set includes 1 Flat Sheet, 90" x 102"; 1 Fully Elasticized Fitted Sheet, 60" x 80" + 16", with deep pockets to fit mattresses from 9" to 18"; and 2 Standard Pillowcases, 21" x 32". 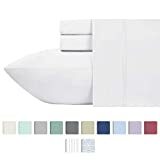 Our Deep Pocket fitted sheet feature Smart Head/ Foot Tag to indicate the width side of the fitted sheet for ease of use. Highest quality dye materials are used for fade resistance. Recommended for regular wash & short dry cycles for superior softness. CERTIFIED STANDARD 100 BY OEKO-TEX - Your new sheets are tested thoroughly to ensure the utmost safety and comfort. Every inch of our fabric meets top performance standards for pilling, shrinkage, color fastness, strength, and thread count. Extensive product checks and ongoing audits ensure sustainability. Each piece of fabric is measured individually and each linen is stitched to perfection. Before packaging, we inspect each piece individually to ensure it is flawless.